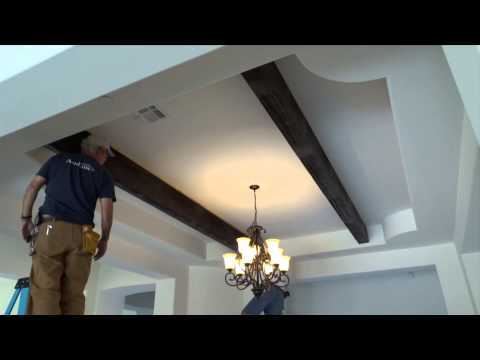 If you are looking for a step by step tutorial on how to install faux wood beams, read our guide and watch the video tutorials we included. Back when construction was strictly practical, and the sole purpose of buildings were to provide shelter, structural integrity was kept using large support beams. These beams distributed the weight of heavy roofs and second stories for open floor plans, where there were few walls to support that weight. Home decor has its own fashion, so to speak. There are countless classic clothing styles that have come back into popular demand for the simple elegance they add to a person’s outfit. In the same vein, the open floor plans of yesterday are once again desirable to those seeking, designing, or remodeling their dream home. With open floor plans come the traditional, rustic accent that support beams add. If you are a fan of any of the popular home renovation television shows, you have seen these used time and time again as walls are taken down to combine kitchen and dining spaces in an effort to bolster the flow of a home from room to room. But what if the walls closing off the spaces in your home are not load bearing, but you still want the aesthetic that a beam can bring out? The solution is faux beams and lucky for you, they are affordable, easier to work with, and subsequently relatively easy to install. Certainly, if you are feeling ambitious, you can make your own faux beam. This can be done simply by securing lengths of decorative wood together in a three or four sided box. To make these faux beams look authentic, you will have to join the edges either by mitering or by rounding the seams. The extra work in constructing the faux beam yourself, though, might inspire you to go out and explore the many premade faux beam options on the market. The faux beams on the market look more akin to hollowed out whole beams, a process that would be a massive undertaking to go at alone. It also seems silly to buy a full construction beam and hollow it out to create a look when for a little more elbow grease you could hang the full beam and add that extra support, even if it is not necessarily needed. What makes the faux beams different from a full hollowed out construction beam is that they are made of synthetic polyurethanes that mimic the look of real wood. The best part is they are lightweight, and do not rot or distress the way a wood beam would. With distress in mind, you can also choose from a wide variety of beam styles. There are smooth, glossy finished beams, or even those that replicate the look of hundred year old wood structural supports, depending on what you are looking for. Faux beams come as three or four sided and typically are sold in six, eight, and ten inch widths at eight, ten, sixteen, and twenty foot lengths. Based on these measurements, these beams range in price from $250-$1500. In addition to size, price is also dependent on number of sides and style. The outline below demonstrates the installation of a three sided beam because it is slightly easier to install to a ceiling that is intact. 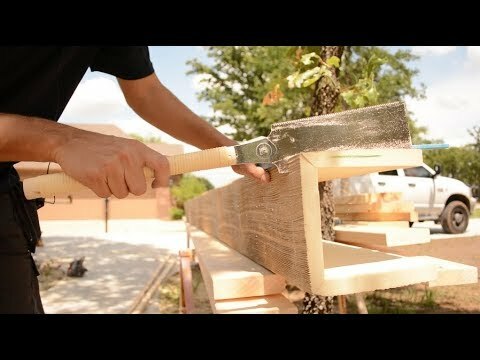 So you are ready to install your three sided faux beam. First and foremost, it is of huge importance that you get an accurate measurement of the length and width of the room or threshold where the beam will fit. Measuring is by far the most common place where do-it-yourselfers make mistakes. Unfortunately, these mistakes can throw off the entire project, especially if you overcompensate for length or width and cut too short. To make sure that you are fitting your new beam snug into the space, take a measurement from wall to wall. Once you have that number, add ⅛ of an inch. The reason to add this fraction to your total measurement is so that the beam has a really snug fit. You almost want to be able to dry fit the beam without any adhesive. That’s the sweet spot, and as always, measure twice, cut once. Once you have your measurements perfect you are ready to make your cuts. Once again, measure twice, this time on the beam itself. Start from one end so that you only have to make one cut. When drawing your guide lines, use a t-square. This will ensure that your line is perfectly straight and not veering off on an angle. Use a circular saw to cut along the lines on each side. Start on one of the side pieces from the open end. Once you finish the cut, stop, and rotate the beam towards you, so you are now cutting along the face with the open side flush to the cutting surface. Don’t try and cut in one continuous run, rotating the beam while the brade is still engaged with the beam. This is both unsafe, and is the most likely scenario in which you will stray from your guideline. One more tip: before measuring or cutting, let the beam sit in the room where it will be installed for 24 hours. Because of the synthetic material of the beam, it is subject to some small movement. Let it acclimate to the temperature of the room so that you get an honest measurement. Once you have made your cuts, dry fit the beam to double check that you are spot on. Remember, it will be snug, so you may have to use a rubber mallet to work it into place. Dry Fitting is much easier if you recruit some help. You can also use a dead man, which you can construct yourself from some scrap wood. A “dead man” is the name given to a temporary ballast or support in engineering. It’s name is derived from the fact that typically these supports are buried in the ground. For our ceiling beams, we will not need to ground anything, and so our “dead man” will essentially be a free standing t-shape made of 2 x 4’s. The purpose of the dead man is to support the beams on one end of the ceiling while you work on the other end, and it is totally worth it to take ten minutes to measure, cut, and screw the two boards together. It will be a big help as you complete this project. Now that you have ensured that the beam fits nice and snug, you will need to take it down and get some measurements on the inside width of the structure so that you can plan your anchors. Flip the beam on its face, or the side that will be facing the floor when it is hanging. Measure from the inside of one side board to the other. You will use this measurement to map out the beams placement on the ceiling, and to cut your anchors. Using painter’s tape, map out the width of the beam along the ceiling where it will be placed. You want the outermost edge of the tape to align with the inside edge of the side board on the beam. This way, no tape will be sticking out once the beam is installed. It is hugely important that you are reminding yourself as you work that the tape’s outer edge mimics the beams inner edge. These are the types of little details that can be lost as you move through each step in the process. If you misconstrue how the tape is to align to the beam, it could mean the loss of time and money as you backtrack to clean up your mistake. With the beam’s placement mapped out along the ceiling, you can begin cutting anchors. You can use wood that is 2 inch by 4 inch or greater. You will want at least 2 inches to work with so that you can secure the beam to the anchor with a screw from the outside. 4 inches or greater along the edge ensure that screws are placed with enough distance apart for each anchor. Measure the anchor wood to match the distance from the inside edge of the side boards on your beam. This number should also be reflected by the distance between the outer edges of the painters you’ve used to map the beam’s placement on the ceiling. With the anchors cut, you need to figure out exactly where they will be placed. A good rule of thumb is to start as close to the wall as possible leaving three of four feet between each anchor. This is contingent on finding a stud or joist. In order to do so, use a stud finder. If you are having trouble locating one close to the wall, you can use mollies to lock down you anchors. Mollies are okay in this situation because of the light weight of your faux beam. While it is still preferable to latch onto studs or joists, as long as you are able to catch a few, the weight of the beam will distribute itself enough that there should not be too much strain on the mollied anchors. The next step is to set the beam over the anchors using a bit of construction adhesive. Apply a liberal amount of adhesive along the edge of each anchor, then using some recruited help or your dead man, fit the beam into place again. Since you went ⅛ of an inch long on your beam’s length, it should hold snug until the glue sets. After the glue has had time to set, you can secure the anchors indefinitely using screws. It is important that you know how far your first anchor is from the wall if it is not butted up against it. This way, you will be able to easily locate the anchor when you go to drill. The subsequent anchors should all be an equal distance apart, so there should be no problem finding those. Once you have identified the location of that first anchor, drill pilot holes through the side of the beam about ¾ of an inch down. This should put you squarely in the center of your anchor’s edge. Two screws per side per anchor is preferable. Use a finish screw, like the ones use for trim work, to secure your beam. These are best for a couple of reasons. First, their standard use is for high end finish work and trim, so they are designed to secure small decorative pieces without splitting the wood. This is paramount as a construction screw that is placed a little off center on one of the anchor edges could easily split the side of that anchor. Second, they are sold is various colors to match the material they are being used with. You can easily find a darkened finishing screw that is close to the hue of your faux beam. This way it won’t be visible. In the worst case scenario, you can always counter sink. With your beam fastened securely to the anchors, you are pretty much done! The last step in the process is sealing up any gaps that exist, either between the beam and the walls or along the edge that meets the ceiling. The best bet is probably a white caulk that matches the ceiling, however, you will likely be able to find a dark or wood color caulk if you decide it is best to match the beam itself. As you can see, the faux beam installation process is totally manageable as a do-it-yourself project. Why bother with heavy and expensive construction beams if you don’t need them for structural integrity? With all of the beautiful faux beam options out there, you aren’t losing much in terms of authenticity to the naked eye. Rather, faux beams provide a rustic, traditional look that highlight those open floor plans without all the baggage that comes with real wood.